12.5" RCOS @ ~f/9 (2880 mm fl) 0.643 arcsec / pixel. Zoomify image scale is 3.34 to 1.28 arcsec / pixel. 9/21/2009 to 10/15/2009 Chino Valley, AZ... with CCDAutoPilot3 & CCDSoft. CCDStack to calibrate, register, normalize, data reject, combine the sub exposures & RGB color. PhotoShop for LRGB combine & on-linear stretching. North is to the bottom... it looks much better upside down. 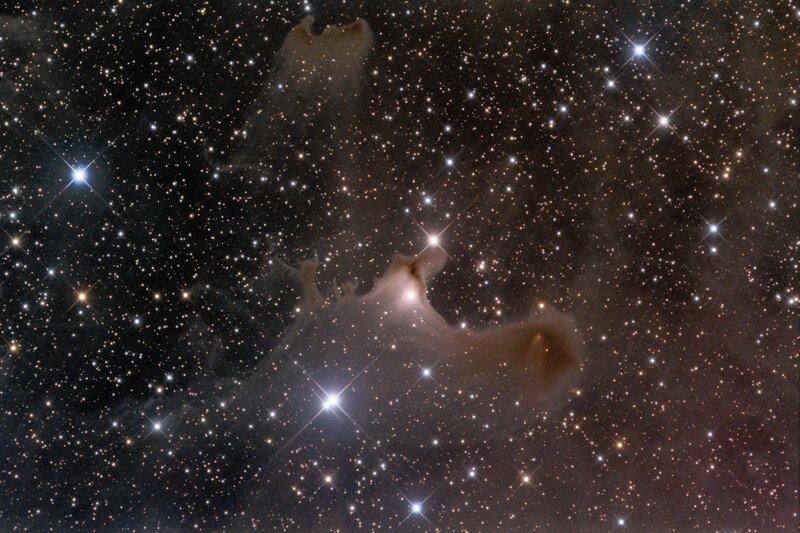 SH2-136 is an illuminated dark nebula, about 1,200 light-years away, towards the constellation Cepheus. Its spooky appearance reminds one of Halloween ghosts and goblins.